Entering the front door a sense of peaceful calm awaits you as you behold the sprawling views of the river framed in evergreens. Kathy's creative flare provides an inviting décor combining antiques, and country. Relax to the sound of the river; put the world on hold! 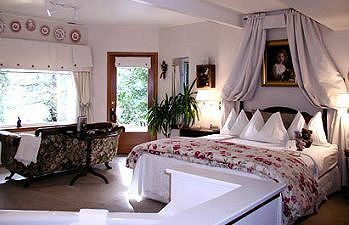 Spacious guest rooms, with spectacular river views, jetted tub for two, river-view seating and king or queen bed. Most with private deck, gas fireplace and refrigerator. Four two-room suites available. The bountiful gourmet breakfast is not to be missed! Lovely garden pathways lead to the river, just 80 feet away with quiet seating areas along the way. A variety of activities are available year round and change with the seasons. From the Bavarian Village, travel the Cascade Loop or take a side trip to Mt. Rainier. 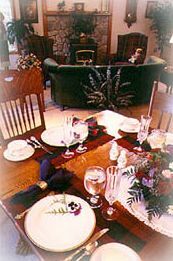 Host, Kathy and Jeff, make every effort to make you stay memorable, and relaxing.